Background: Both entrepreneurs have worked together for the past 12 years, having launched businesses in telecommunications and personal finance. Flipper is a personal energy manager. Our members sign up in seconds without the need to give us any energy provider or usage information. 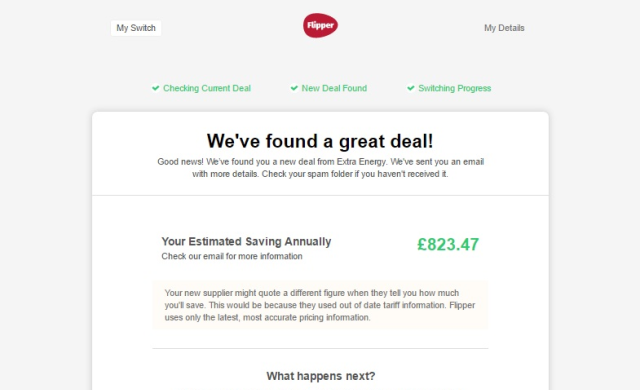 We connect to their online energy account and use their actual usage data to match them to the best deal in the market. We switch them automatically and then run a check every three months to ensure they are kept on the best deal. The current switching process using price comparison websites is broken. Only about 12% of the market switch, even though the vast majority of people can save a significant amount. The existing process is confusing, cumbersome and the commission model makes it difficult for users to really find the best deal. Flipper is truly disruptive because not only does it make the user experience very simple and easy, but by shunning the commission model and charging users a flat fee, we are the only player in the market not influenced by the energy companies and who can actually switch it’s users to ANY deal. Yes, we have received investment from two angel investors. Prior to Flipper, we started a receipt and invoice digitisation platform. Through this business we developed a unique technology stack which enables automatic extraction of structured data from unstructured sources such as receipts, invoices and energy bills. The development of this technology opened up new doors in terms of different business models that could be created using the tech. An automated, ongoing energy switching platform was identified as an excellent opportunity due to the size of the market and the lack of any truly innovative or disruptive models in the space. Notting Hill Gate is a very good location in West London allowing for easy access and travel to most parts of London. The shared working space we are in is also very flexible and cost effective.